Learn the language and acquire the skills you need to excel academically. 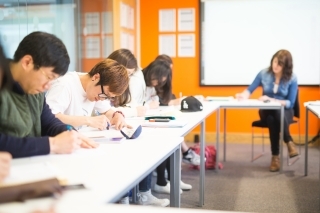 This course is designed specifically for those students who want to be thoroughly prepared for higher education at an English-speaking university, with the aim of giving you the tools and confidence needed for a successful academic experience. English opens doors to a wealth of academic knowledge as well as career opportunities across different fields. This course provides you with the skills and knowledge required to succeed at college or university while training you to become more independent learner though self-study skills, and creates awareness of learning techniques required for success. Dedicated teachers will train you on specific important issues, such as how to reference, how to avoid plagiarism, writing assignments, as well as other academic and cultural dos and don’ts. Monday - Read a text about climate change. Review vocabulary and answer comprehension questions. Tuesday - Group discussion on climate change. Focus on turn taking, expressing opinions, agreeing and disagreeing. Wednesday - Group debate. In teams debate if governments should legislate in order to curb climate change. Thursday - Is it the government’s responsibility to curb industry and individuals? Pick a side in the climate change debate and write a 5 paragraph essay with examples. Friday - Peer edit each other’s essays, giving feedback on content and organisation of the argument.